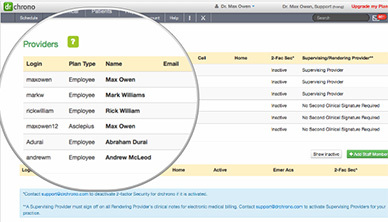 drchrono is easy to setup for your practice regardless of how many physicians or locations you have. Our dashboard provides a bird’s eye view across doctors, office locations or exam rooms; similarly, appointments can easily be set across the practice. Only pay for what you use; our plans are structured so that you only pay for additional providers, not locations. We grow with your practice.